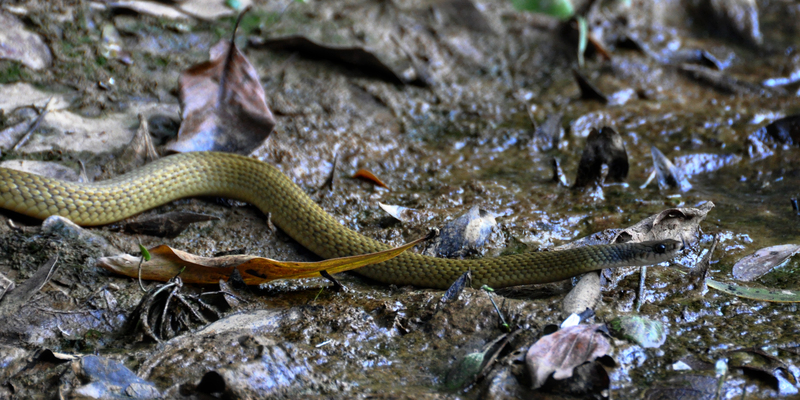 This Keelback or Freshwater Snake (Tropidonophis mairii), one of many that we have recently sighted, is of the typical colouration that we see in our area. I disturbed this snake as I walked along a path but as it stayed on the edge of the water I was able to get a bit closer for a photo without, I am pleased to say, sinking into the mud in my sandals! Its’ tail finishes rather abruptly, most likely due to a past attack, but otherwise a beautiful specimen. 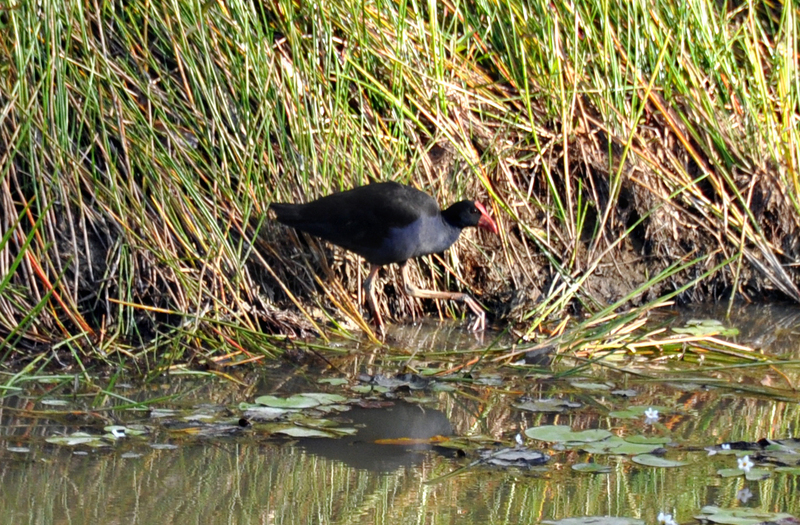 Another creature enjoying our muddy banks is this Swamp Hen (Porphyrio porphyrio) – a solitary bird concentrating on a patch of Spikerush (Eleocharis sp.) which it is pulling up with its tremendously strong feet. 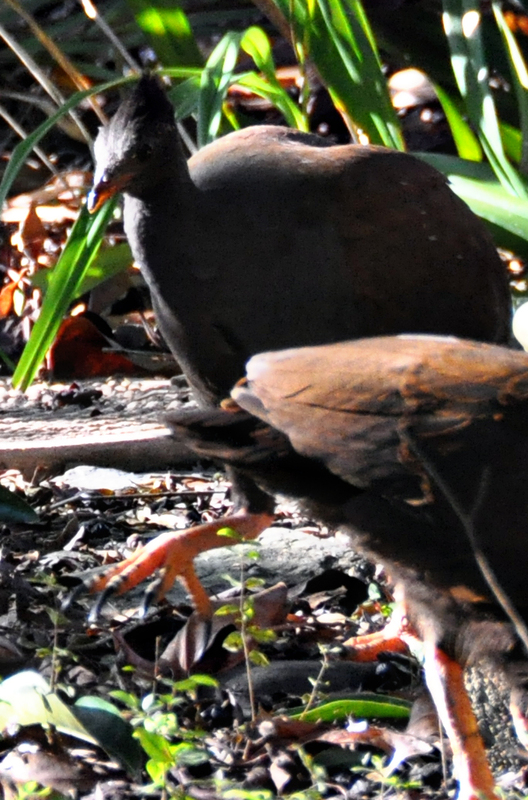 ……………..and talking of strong feet – a pair of Orange-footed Scrubfowl (Megapodius reinwardt) are enjoying a regular afternoon visit to the Jaboticaba tree (Myrciaria cauliflora), native to southern Brazil, which grows just outside our back door. The purple-black fruit are borne on the trunk and main branches of this small tree often less than a month after flowering. Although the skin is quite bitter, the translucent pulp of the fruit is reminiscent of grapes and pleasant to eat. They also make a delicious dark purple jam. The fruit drops off when ripe or when knocked off by bats or honeyeaters so there is always some lying on the ground or landing in the bird baths which require more cleaning than usual – but I can’t move the baths because they have been there for years, I can see them from the kitchen window and they are well used. The decorative fruit is visible in the top left-hand corner of the photo below. 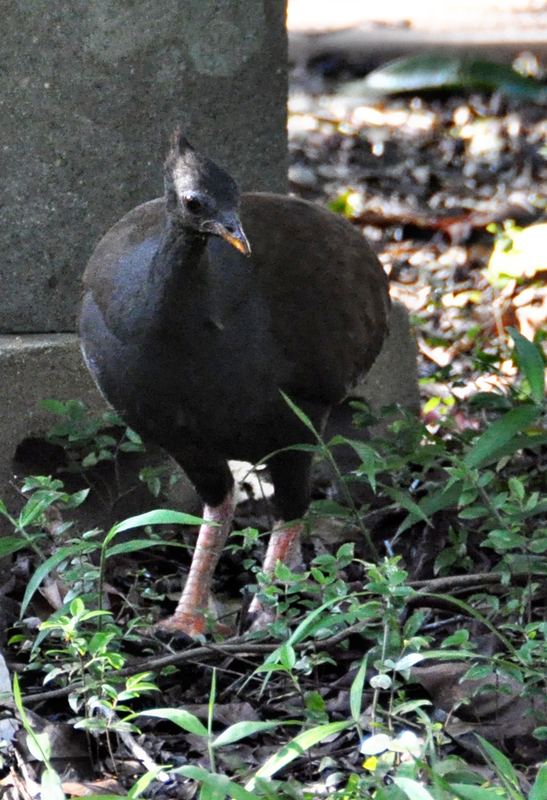 These megapodes are most usually seen in pairs and we have several pairs residing on the property. This particular couple treat our house garden as part of their territory and so far I haven’t had any disputes with them. 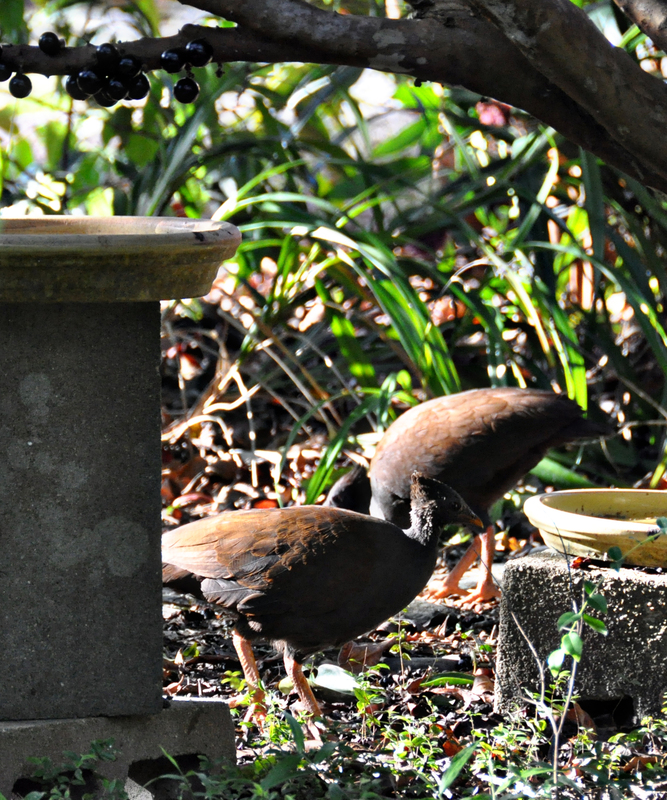 Gardening with domestic fowl can be exasperating sometimes and these ‘bush chooks’, as we fondly call them, are capable of moving a lot of earth with those immensely strong orange legs. I’m pleased that they enjoy the fallen Jaboticabas – plenty to share. This entry was posted in Bird Observations, Pond Life, Reptiles and tagged Freshwater Keelback snake, Orange-footed Scrub Fowl, Purple Swamphen. Bookmark the permalink. I wonder if your “bush chooks” scratch up the weeds of just the good plants. You have a very interesting place. The “bush chooks” scratchings are indiscriminate! Thanks for your comment Mick, it is interesting watching the landscape gradually change as our plantings mature – we’re starting to see Noisy Pittas more often and they are rainforest birds that enjoy scratching through leaf litter so we think they have given us a big tick!